Miriam Burbank, a native and resident of New Orleans, Louisiana, passed away June 1. The 53 year old woman was known for being the life of the party and stayed true to her spirit until the very end. The dead woman became the life of the party and will be remembered as such, as her final send-off was most unusual. Burbank leaves behind many friends and family including her companion Michael Fortenberry, her son Shuntroy and her daughters Samantha, Zymora and Lorel. The daughters requested the help of the Charbonnet-Labat-Glapion Funeral Home, located in the heart of New Orleans. A unique service was planned for Burbank and the event turned into more than a celebration of life, but a party with the deceased woman. 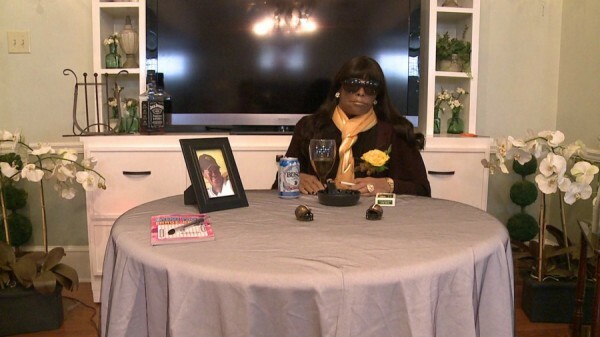 When visitors came to the funeral home to pay their respects to the dead woman, they were surprised to see that it was a party atmosphere, complete with a disco ball. Burbank was propped up in a chair and sitting at a table with many of her favorite things displayed, including a puzzle book. She was all dressed up with a flowing dark wig, sunglasses, gold jewelry and a gold scarf. Her nails had been painted black and gold to reflect her team spirit for the New Orleans Saints. Two small football helmets were also placed on the table next to Burbank. Most noticeable was a pack of menthol cigarettes and a glass of beer. An open can of Busch beer was nearby and a full case was on the floor next to the dead woman. Several bottles of her favorite scotch and whiskey were placed in the area and friends said that Burbank looked quite at home and natural in the setting. The daughters had gone to the extra trouble of creating the unique affair for their mother’s funeral. Many of the friends and family stayed long enough to have one final dance with their friend, as music played and the disco ball flashed its colored lights. Burbank was said to have loved sports, especially the Saints, and to also frequent the bars in the area of the Treme neighborhood. Treme is the oldest African-American community in the United States. As it is always difficult to say good-bye to a loved one for the final time, Burbank was given a special tribute which honored her life and her fun-loving spirit. The attendees seemed to agree with the strange send-off and Burbank became the center of attention and the life of the party one last time. The funeral was held on Friday June 13, 2014. The Charbonnet Funeral Home has been serving the New Orleans area since 1883. They have been receiving more and more requests for non-traditional funerals in the recent years. The dead woman in this case, Miriam Burbank, almost seemed alive and enjoying herself as it looked like she was listening to music with a smoke and a drink. The Schoen Funeral Home, also located in New Orleans, handled the extravagant funeral for Mickey Easterling, earlier this spring. The well known socialite in her 80’s, had planned her own garden party well in advance of her death. She was embalmed and placed sitting on a park bench surrounded by flowers. Donning a fancy hat and a bright pink boa, she was visited one final time, as she appeared to be toasting her own life with a glass of champagne and a cigarette in a holder. Anything is possible for a final send-off. Burbank, Easterling and Standley are just a few examples of some of the unique funerals now taking place.